This is one of my favorite cards that I've used for many ocassions again and again (just switching the greetings). A friend of mine, fellow demonstrator (who prefers not to be named), made this card at her workshop years ago using a different color theme. Again, I use this card all the time with different color and have not gotten "sick" of it yet. I am posting it to show that for Valentine's Day you can make cards like this (and the SDC 12 card I posted previously) instead of or in addition to the traditional "heart/love" cards. 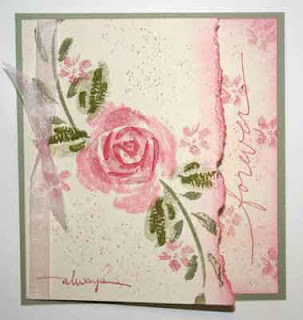 Roses in Winter (Retired) -- however you could substitute with Baroque Motifs or many other stampsets. 5x5 Sage Shadow cardstock, not scored. Confettie white is 10x5 , scored at 5 inches. Adhere the bottom, scoring on the left. Use the Tearing Tool to make right edge. Stamp as desired, sponging edges. Flowers are with Pinks, Leaves are Sage and Old Olive. Sage Marker is used with Color Spritzer. Tie Ribbon on left edge. this is a gorgeus card!!! !